Do signals point to higher credit card rates? The U.S. bank prime rate did not change in early August, remaining at 3.25 percent. Only one category of credit cards saw a rate change in the first half of August, and that one change was due to a card temporarily being pulled from the market rather than an actual increase in rates. However, while card rates generally held firm, the signals more and more seem to point to higher rates in the future. The trends that may drive rates higher have been taking shape for months, but may have been neatly encapsulated by events at the end of July. The month ended with news that the economy rebounded impressively after a first quarter slump, and that the Federal Reserve is encouraged by what it sees in the economy. July also ended with a steep decline in the stock market that might hold a clue to what lies ahead for credit card rates. In terms of that rebound, the Bureau of Economic Analysis (BEA) reported that the U.S. economy grew at an inflation-adjusted annual rate of 4 percent during the second quarter. This would have been considered a healthy rate of growth in its own right, but it was especially impressive after the economy had contracted at a 2.1 percent rate in the first quarter. The return to growth sweeps away the concern that the economy might have slipped back into a recession. The Federal Reserve echoed this positive trend in the notes to its latest Federal Open Market Committee meeting. In particular, the Fed noted that employment and inflation indicators were signalling healthier growth, allowing the Fed to continue to taper back on its stimulative bond-buying program. This may all sound like good news, but the very next day after the BEA and Fed announcements, the Dow Jones Industrial Average dropped by over 300 points. What spooked the market? A prime suspect seems to have been fear of higher interest rates. These could result from any combination of stronger demand for credit, tighter Fed policy, or higher inflation - all of which would be byproducts of a faster-growing economy. Credit card customers should take note of the stock market's concerns. To some extent, improving credit conditions could offset some of the higher-rate influence of the first two factors, but if inflation takes a more prominent role in the economy, expect to see credit card rates move higher in the latter part of 2014. Both non-rewards and rewards credit cards were unchanged in early August. Credit card customers who are concerned about rates rising going forward should pay particular attention to keeping their credit ratings strong, because customers with good credit are most likely to continue to be able to take advantage of lower rates. 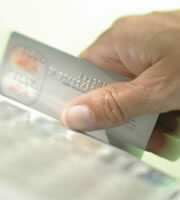 The average rate for student credit cards remained unchanged in early August, at 17.56 percent. For the first time since early May, there was a change in business credit card rates, with the average rate for rewards credit cards rising by 11 basis points to 15.42 percent. Significantly, this was the result of one of the credit card offers tracked by this survey temporarily being pulled from the market rather than an actual increase in any rate offer, but any reduction of availability is a potentially negative signal for consumers. The spread between rates offered to consumers with excellent credit and the overall average consumer rate remained unchanged, at 4.01 percent. 0 Responses to "Do signals point to higher credit card rates?"